Big Finish: Doctor Who THE COMPANION CHRONICLES, The Second Doctor – Volume 1 | Warped Factor - Words in the Key of Geek. Tony dons the kilt and gives his knees an airing. Make no mistake – this should actually be titled The Companion Chronicles: Jamie – Volume 1, because it’s the hairy-legged Highlander who’s very much the focus of this set. In fact, that would be a great new money-spinning direction for Big Finish – Companion Chronicle sets explicitly showing the development of a particular companion across their time with (and possibly even after) the Doctor, and in the event of such a series taking off, there’s no doubt that this collection maps the way to go about it. Four stories, all delivered in the classic Companion Chronicle format of narration plus additional voices. Of course, the weird thing about a Jamie collection like this is that it very much flirts with full-cast territory, because Frazer Hines, more than either of the Troughton boys, has become a scarily accurate avatar for Patrick Troughton, and so gives you two voices (at least as far as the listener’s concerned) the price of one. Adding Anneke Wills as Polly, Elliot Chapman as Ben, Deborah Watling as Victoria and Wendy Padbury as Zoe really does give this set the feeling of oomph and fullness, and allows us to experience four different ‘Jamies’ over the course of his time with the Doctor. In The Mouthless Dead by John Pritchard, we’re in the 1920s, messing about with railway lines in the mist. We’re also dealing with the phenomenon of national grief and catharsis as we await the train bringing home the body of the Unknown Soldier, and, in terms of the in-universe story development, we’re at a point where the then-modern Ben is left alone with the Highlander, and the two find ways to respect and understand each other, rather than being essentially two warriors from different points in history, always one jibe away from clashing. This story helps show a young Jamie’s ability to appreciate Ben’s skills, and a Ben able to respect Jamie’s instincts and his personal bravery. Of the four stories in this collection, The Mouthless Dead has – ahem – the biggest teeth, the most classic scares, and the delivery is such that it evokes chillers like Dickens’ Signalman, occasional Twilight Zones, and also something Hitchcockian in the slow peeling back of layers of fear. Of the four, it’s the one that will stay with you longest, and even in this jaded technocentric age, it’ll give you things to think about long after you’ve finished it. The Story of Extinction catapults us to the other end of the spectrum, on a world positively swarming with data archaeologists, trying to uncover its mysterious history. A world where previous civilisations have sprung up – and then died out after evolving to the point of cave painting monsters on walls. There’s plenty to love here – a great ‘threat’ on two levels, and something to think about in terms of our own society, with our tablets and smartphones and most especially our memes. The idea of what is essentially ‘smartpaper’ deserves some applause for writer Ian Atkins, as does the idea planted in our minds here of exactly how smart our smart creations can be – and whether, if we make them that way, we can entirely keep control of them. What’s more, the nature of the actual Big Bad is such that it makes for creepiness in a way that would have been perfectly Troughton. Just as The Mouthless Dead would have tapped into the black-and-white, things-coming-out-of-the-mist potential of the era, so The Story of Extinction would have capitalised on relatively low monster budgets, though the smartpaper (or Parchment as it’s called here), would have been much more of a challenge to the effects department. In terms of both philosophically creepy ‘monsters’ and proper, forward-looking science-fiction though, Atkins has some great mojo working for him here. And in terms of the development of Jamie, there’s enormous potential here too, with Victoria teaching the Highlander the basics of his alphabet – not something he’d ever had a need for before. Without ever straying too far from the script of their on-screen relationship, there’s a frisson of tension here between Jamie and Victoria too – a sense of something that could be built, something that could alter their relationship, and something that perhaps strikes one or both of them as too dangerous. There’s a moment here where history holds its breath, and a path is chosen for these two young people, cast adrift from their own homes and times, with only each other to really turn to, learn from and confide in. The Integral by David Bartlett is…odd. It’s probably the most traditional of the four stories in this collection, while striving at the same time to be something new and refreshing. Bringing Later-Jamie to the fore, it begins with a philosophical argument between him and Zoe about the nature of aliens – whether they’re all out to invade and enslave humanity or not. And Bartlett strives to deliver what is somewhat loftily called a ‘siege under base’ story (no, we don’t know either – sounds like the kind of thing you say when you’re not entirely sure what you want), that offers Jamie a turning-point in his mentality, to show that not all aliens are evil, and not all humans are innocent victims. Whether it succeeds in that of course depends on whether the ‘Integral’ – the aliens of the piece – are really as benevolent as they make themselves out to be, but what certainly comes to the fore in the third story is what Jamie does with his baser instincts, turning savagery and anger into bravery and protectiveness, a readiness to stand and fight anyone who threatens harm to the Doctor, to Zoe, or to the good people of the universe. What might be called ‘The Jamie McCrimmon Factor’ is actually central to the solution of the story, which could also be seen as an allegory of mental health treatment. Suffice it to say that in a choice between artificial treatments that dope such patients to nullify their dangerous tendencies and more natural therapies that allow people to channel their rage in productive or creative ways, you can do far worse things than following the way of the Highlander. And The Edge by Rob Nisbet is another fairly stock, fairly traditional Second Doctor story that allows Jamie to really shine in the foreground – in a nebula of Interesting Rocks, a supremely clever intellectual is running a drug racket dealing in a substance that works like the Limitless compound, making you smarter. While – as in things like The Krotons – the Doctor and Jamie are duped into laboratories by virtue of being intolerable show-offs in tests, Jamie is thought to be an irrelevance, and people are sent to kill him. This is Jamie as the action hero – there’s a bit of dangling from cliff-edges, a bit of subsequent sky-diving, and a bit of working out mid-air how best to avoid not being a squishy mess on the ground. This is Jamie as Bond, essentially, running around like a stainless steel rat in the wainscoating of the Clever People who misjudge him. He’s responsible not only for bringing down the drug runner’s empire single handed, but also for showing that he’s fundamentally better than him, by virtue of being exposed to the Doctor’s philosophies. Nisbet in the extras claims that’s the real legacy of Doctor Who, the betterment of people and situations by accepting the Doctor’s philosophies of kindness, and he makes his point throughout what is a tight, effective if never especially challenging story. This Jamie collection shows us the evolution of the young McCrimmon into a man unafraid to take on the universe’s worst, with principles and skills and a mind far more open than his heritage would ever have required of him. It’s a love song to one of the Doctor’s best companions, who frequently gets overlooked on the lists. It’s well worth investing in, and shows four different sides of the growing Scot’s personality in a masterclass from Frazer Hines. Oh and there’s a Marvel Moment here – make sure you listen to the very end of the interviews for an extra-special Troughton-tastic gift from Hines that will warm your Who-loving heart. 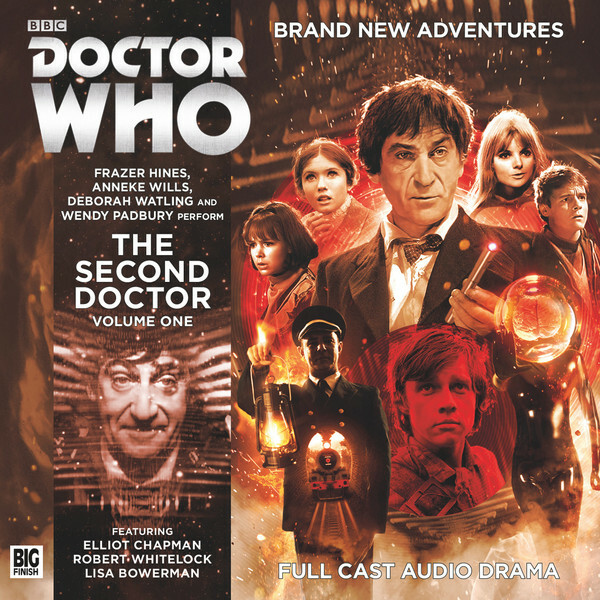 Get the Companion Chronicles, Second Doctor Volume 1 today for one of the most coherent sequences of stories the range has ever produced, and a perfect primer into the life and development of Jamie McCrimmon.